Bagluxe, a specialty online retailer of fashion-forward chic, affordable handbags, purses and accessories (influenced by the latest runway and celebrity trends) knows that every girl has a passion. Well, Bagluxe has a passion too... it's handbags, of course! Their website features a wide range selection of fashion handbags and related accessories -- all priced at under $85.00. The company aims to build a trusting relationship with women who love handbags by ensuring superior customer service and offering quality, inexpensive products that are always on-trend. 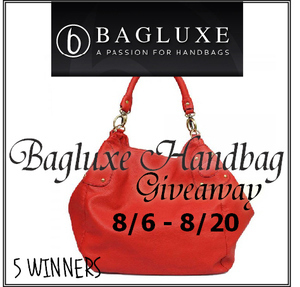 Who doesn't want to carry a great looking bag especially if you can win one! What's even better is that five will win! Now, I don't win very many giveaways so if you win from my blog, please let me know. Would love to win a bag, so appreciative of the promotion! The Dematria Embellished Flap Satchel Grey is nice! I like the Samantha Metro Shoulder Bag Silver. I would love to win the Verkley Manhattan Handbag in Black. Such a beautiful bag. It is a toss up between the nidda double pocket hobo bag and thre libbi shoulder purse. i like the Cielo Braidy Tote Black! I love the Dematria Embellished Flap Satchel Grey! I like the Northern Boulevard Slouch Tote Silver! Diona Jewel Embellished Hobo Black looks amazing! LOVE IT!